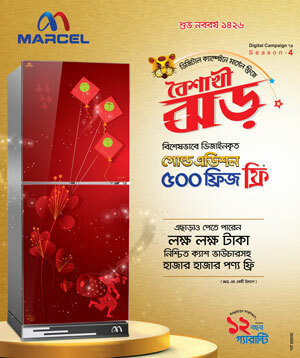 Staff Reporter: Local brand Marcel started Season-4 of its Digital Campaign across the country following huge responses from customers to the campaign as well as the commencement of the month-long 24th Dhaka International Trade Fair- 2019, the country’s biggest trade show started at Sher-e-Bangla Nagar, Agargaon in the capital. Marcel announced various sorts of customers’ benefits for those customers who will registrar their products purchased from Marcel Pavilion in DITF-19 or any other outlets across the country under the Season-4. This time, a customer of Marcel fridge, television and air conditioner will get sure cash vouchers up to Tk 1 lakh or free motorcycles, fridges, televisions, air conditioners, laptops and others sorts of electronics and electrical appliances on each product registration. Marcel officials announced these at the declaration programme of “Marcel Digital Campaign Season-4” at the conference room of Marcel Corporate Office in the capital on Tuesday (January 12, 2019). The function was addressed, among others, by Executive Directors Eva Rizwana, Amdadul Haque Sarker, SM Zahid Hasan and Md Rayhan, Head of Sales Dr. Md. Shakhawat Hossen and Deputy Executive Director Ariful Ambia. In the function, the officials informed that last year Marcel conducted three seasons of its ‘Digital Campaign’ across the country. These seasons of the campaign received sound responses from the customers. During season-1, several customers got free return air tickets of America and Russia. In addition, thousands of customers got various sorts of products like brand new cars, motorcycles, fridges, TVs, ACs etc. through purchasing Marcel products during the campaign’s season 2 and 3. Considering the customers’ eagerness to registrar their products during the campaign’s last seasons as well as the advent of month-long DITF-19, Marcel started the season-4 version of the campaign. Through the product’s registration, details of the customers and their purchased products including the name of customer, contact number and the model number of the product are being stored on a server. As a result, he said the customers can seek post sales services browsing the Marcel developed web page http://support.marcelbd.com and also they can see the status of the product from online.